We offer children's classes from 10-10:50 every Sunday morning from September through July. Classes include age-specific Bible stories, songs, and crafts. To ensure the safety and security of our children, we ask that parents check in and check out each child at the kiosk in the toddler nursery or upstairs near the elementary classrooms. Your child will receive a nametag and claim ticket to use at pick up. Each class is explained in more detail below. For children ages 3 through kindergarten, we offer Children’s Worship. Children's Worship is based on Godly Play, a Montessori-based curriculum, and is a time when children gather for worship through song, Bible stories, and response time (responding to the story through art or creative play). It occurs each week during the offertory and sermon portions of the worship service. Children are also welcome to remain with their parents throughout the service. We offer two classes for preschool-age kids, one for 3s and one for 4/5s. Each fall, we work through Old Testament stories, and the New Testament each spring based on the Show Me Jesus curriculum. We also do crafts, sing songs, memorize Catechism and scripture, and pray weekly. For questions about our preschool children’s ministry, contact Nikki Reed [nikki@redeemindy.org]. Kindergarten-3rd grade elementary students are on a four-year chronological journey through the Bible using The Gospel Project curriculum. 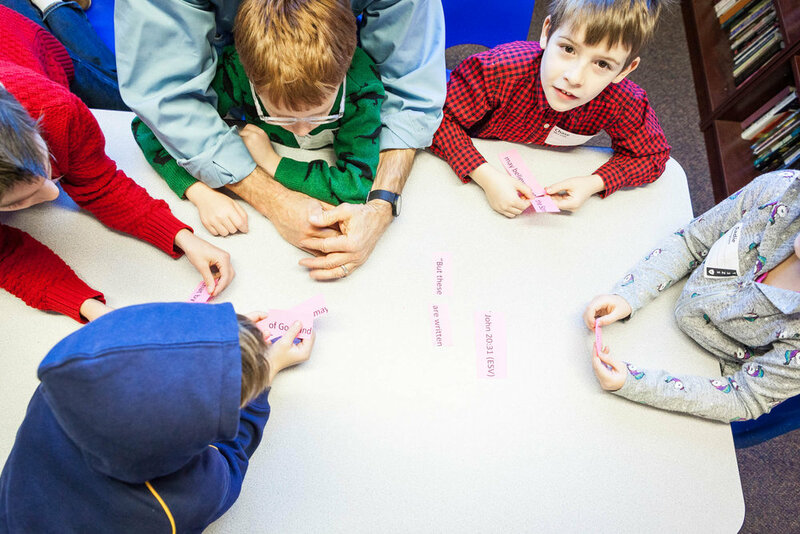 Each class meets together for story, music, discussion, games, and crafts that reinforce the lesson. 4th-5th grade elementary students started the academic year with a series about the Gospel in the book of Mark, find out what it means to be part of the church in a communicant study, and end the year with a look at the Psalms. All elementary students meet in the classrooms upstairs by the Redeemer staff offices. Communicant Class (3rd-5th grade): This class prepares kids to become communing members, which means they are able to begin taking the Lord’s Supper during the worship service. While we will spend the bulk of our time studying topics covering creation, fall, redemption, and restoration, we will also specifically study each of the five membership questions. Please contact Todd Dawkins [todd@redeemindy.org] to sign up your child for this class or if you might have any questions regarding our communicant process at Redeemer. At Redeemer, we want all children to feel welcome and to be able to participate in children’s classes and worship services. We desire to partner with parents to find the best ways to include all children. Buddies build a relationship with and provide assistance to children who need additional help to participate in class. There are also sensory resources available for use during class and service times. 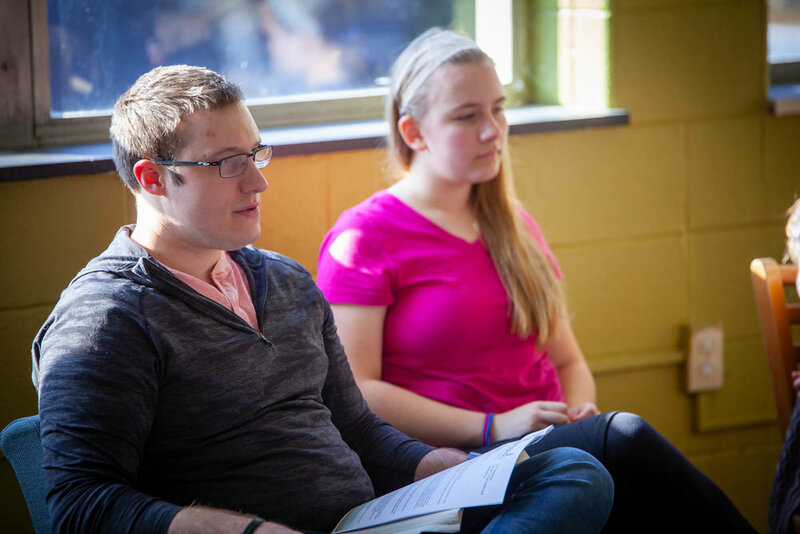 Redeemer's youth ministry is focused on connecting high school and middle school students to Jesus. We meet on Sunday mornings for classes and Sunday evening for large and small group activities. We have ministries and activities for both middle school (6th - 8th grade) and high school (9th - 12th grade). Youth from Redeemer Presbyterian Church and our daughter church, Fountain Square Presbyterian, meet together. See our events page for any special events for youth. Please contact Caroline Fridblom for more information about Youth Ministry at Redeemer. High School meets in the New Hope Counseling suite (Room 207), middle school meets in the youth room (Room 204). Both rooms are on the second floor. Youth group meets on Sunday evenings 6:30-8:15 in the Redeemer Youth Room. Our Sunday Classes, CT&T (Christian Teaching and Training), are a place for you to go deeper into God’s word in community, guided by leaders who want to help bring God’s truth to bear on every corner of your life. Our classes will not only make you think, but impact your heart and life as well. Classes meet between services, 10:00-10:50 a.m.
Our community group ministry is a driving force here in that it is more than a bible study taking place for an hour each week. Our community groups are centered on engaging in intentional Christian community where we live and how we seek to be a Kingdom presence there. In connecting people to Jesus within community groups, we believe the people of Redeemer will grow more and more in the gospel and their identities as sons and daughters of the King. We trust this Spirit-changing work will ignite a movement of the gospel that changes Indianapolis, spiritually, socially and culturally. Interested in checking out or joining a Community Group? Contact Amanda Edgell. Redeemer Women exists to connect women to Jesus and to each other. The main way we hope to accomplish this is through semester-long Women’s Bible Studies, and one-off events like book discussions (OneRead) and small dinners (Meet & Eat) throughout the year. We look forward to connecting with you! Interested in learning more about Redeemer Women? Contact Erin Anderson.